JAM Media Response, of Borehamwood, Hertfordshire has been honoured with the exclusive 2008 Award of Excellence for the second consecutive year. The award is presented annually by the International Call Management Association (CAM-X), the industry’s Trade Association for providers of call centre services including telephone answering and message delivery. 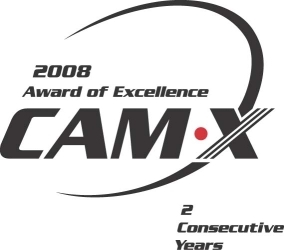 JAM Media Response was presented with the award recently at the CAM-X 44th Annual Convention and Trade Show held at the Deerhurst Inn, Huntsville, ON. Independent judges are contracted by CAM-X to evaluate message services throughout Canada over a six-month period. The criteria for scoring include courtesy, response time, accuracy and overall service to their clients. If the company scores 80% or better in ALL categories, they are presented with the coveted Award of Excellence. The program is now in its 19th year. Now a two-time winner JAM Media Response earned the Bronze Award for two consecutive years. CAM-X extends its congratulations to the staff of JAM Media Response on their proven quality service to their customers.